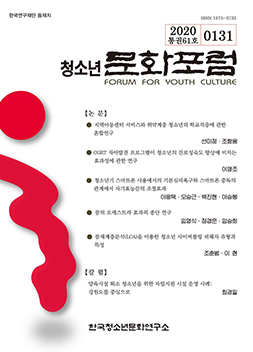 In 1992, the Research Center for Korea Youth Culture (RCKYC) was established even with lack of societal concern for cultural research on youth culture in korea. During the last decade, RCKYC has been tried to find out the best paradigm to understand the cultural trends of young people fitting to information society. In addition to these effort, RCKYC has developed various activity programs and initiated those to promote the cultural diversity among young people in korea. It may fairly be said that the findings of many researches and the program of RCKYC had been signficantly influenced the Korean society. RCKYC has many plans to leap up to the research center to study youth culture and develope cultural programs reflecting globalization in 21st Century. It is our promise thar RCKYC will continue to carry out its functions as the research center to provide the vision of youth culture for the sustainable development of nation for new milenium era.